Rethink Your Study Habits: Educational Psychology Research Says So! A native of Indianapolis, Stephanie Asdell is pursuing her B.A. in Cultural Anthropology, with minors in Biology and Global Health, from Duke University. She plans to attend medical school in fall 2018 and later pursue a Masters in Public Health to further her interests in community and women's health. 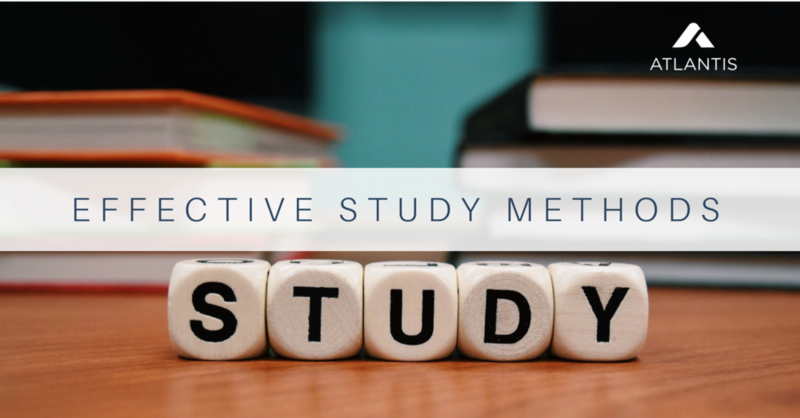 In the post below, Stephanie explains the difference between effective and ineffective study methods, exhorting her fellow pre-meds to utilize the educational-pyschological strategies linked with higher performance and retention. Your first college science exam is on the horizon. Do you practice the study methods you used in high school? Or should you try something new? We all develop a set of go-to study habits in our K-12 years, and those habits can be hard to break. However, it may be in your best interest to heed what the educational experts are saying about how to learn and retain information most effectively. In the following article, you will find the tools that can enable you to achieve the high-level retention necessary for college-level exams. In the following article, you will find the tools that can enable you to achieve the high-level retention necessary for college-level exams. Educational psychologist Dr. Henry L. Roediger III and his team evaluated several study strategies to see if their benefits could generalize across four categories of learning: learning conditions (studying alone vs. studying in a group), student qualities (such as age or ability), materials (such as scientific concepts or historical facts), and the ways in which learning is measured (such as essay tests or multiple-choice tests). The authors also asked whether the strategies worked both in laboratory settings and in actual classroom settings and how easily they could be implemented. The team found that several common study strategies lack sufficient evidence of effectiveness. For example, while you may have been instructed to highlight important phrases, re-read assigned texts, make mnemonics, draw visuals or summarize content, Dr. Roediger suggests that these strategies are not worth your valuable time. Stop highlighting and re-reading passages, making mnemonics, drawing visuals for textual information, and summarizing. Dr. Roediger stresses that there is not a strong enough body of evidence within the field of educational psychology to prove these strategies worthwhile. Again, Dr. Roediger stresses that there is not a strong enough body of evidence within the field of educational psychology to prove these strategies worthwhile. Unfortunately, this reality has not trickled down to the classroom level. Thus, although you may have employed them since elementary school, research simply cannot point to a correlation between these study tools and retention of information. Therefore, your study sessions could be more efficient by implementing the generalizable skills outlined below. Distributed practice, as opposed to massed practice, is the strategy of studying parts of the material for shorter periods of time and for separate, repeated intervals. In practice, this could mean studying half of your material for an hour a day beginning a week before your exam and alternating which half you are reviewing. You may already be familiar with the polar opposite of this strategy, in which you study all of the material for a longer duration of time closer to the exam date. Dr. Roediger advises against this. A separate study by educational psychologists Keppel et al. (Figure 1) displays the effects of massed vs. distributed practice. In this study, high school students were given a list of nonsense vocabulary pairs to review and were tested either one day or one week after study sessions. While the group that utilized massed practice performed well after a one day period, they demonstrated considerable loss of information after one week. In contrast, the group that utilized distributed practice exhibited less forgetfulness after a week. Lessons from these findings, if practiced, could translate to greater retention of information, which could aid you not only in remembering concepts on your final exam but on standardized tests such as the MCAT. Thus, spreading out your studying across multiple days, or even weeks, can promote more durable learning. Cordoning off chunks of your biology material and setting aside one hour each day for the next week can certainly fit into a busy schedule more easily than studying for seven hours straight the day before the test. Additionally, retrieval practice, or formalized self-testing, provides a surefire way to not only retain concepts but to reproduce this knowledge on an exam. Accustoming yourself to quickly and accurately retrieving information allows you to keep the knowledge in an “accessible state” so you can not only recall the concepts on an actual examination, but have the concepts mentally available to apply to more difficult problems. Examples of effective retrieval practice are making flashcards, writing practice exam questions and answering them, and completing blank practice tests. This strategy can even be collaborative. Figure 2 shows the results of another one of Dr. Roediger’s studies. In this study, students who practiced retrieval exhibited higher percentages of correct answers on a final assessment in all cases. The variety of questions tested -- verbatim or inference and multiple choice, short answer, a hybrid of these in massed intervals, and a hybrid in spaced intervals -- all demonstrate the benefits of retrieval practice. These results are particularly useful since many college exams consolidate several types of questions, and retrieval practice could be used to study for a variety of subjects and exam types. Consider introducing interleaved practice, elaborative interrogation, and self-explanation into your arsenal of study strategies. Dr. Roediger also provides several evidence-based strategies that are not as generalizable across the categories mentioned above; however, they could serve you well if you find yourself in a time crunch. One such method is interleaved practice, which involves alternating between two or more topics of study within one study session. While this practice certainly has a cognitive basis, it may also aid in preventing burnout if the mind is constantly stimulated by different subject matter areas. This could also be a way to complete your studying for multiple classes at one time. Figure 3 provides graphical evidence for the benefits of interleaved practice vs. massed practice of one subject. Dunlosky et al., a team of education psychologists, found that interleaved practice yielded higher results on the actual test (shown by the group on the right). The data on the left reveals that students using massed practice strategies performed much higher on practice tests than the actual test. This research may speak to the illusion held by many “crammers” that they know the information during their long study session, but fail to reproduce correct answers on the exam. Thus, switching between different subjects or even between different concepts within one subject might enhance exam performance. Dr. Roediger also cites elaborative interrogation, or the practice of explaining to oneself why a concept is true. Like interleaved practice, this strategy does not necessarily require as much foresight or time as distributed practice or elaborate forms of self-testing like flashcard use. Connecting concepts to each other or identifying the numerous cause-effect mechanisms present in biology reflects the higher-level analysis expected of college science students. Additionally, self-explanation could aid in performance on college-level exams. With this strategy, students explain a procedure or process to themselves, as a professor in office hours or an online video would. While you may garner some looks in the library if you choose to employ this method aloud, that A on your exam would make it all worthwhile. In summary, here is a table of Dr. Roediger’s most-validated strategies with examples, ranked from most effective/generalizable across contexts to least effective/least generalizable. While it might seem daunting to adopt new study strategies, take some time to heed what current educational psychology research is saying about what is, and is not, worth your precious studying time. Acing your college exams is less about difficulty and duration of studying, and more about efficiency and effectiveness. A native of Indianapolis, Stephanie Asdell is currently pursuing her B.A. in Cultural Anthropology, with minors in Biology and Global Health, from Duke University. She plans to attend medical school in fall 2018 and later pursue a Masters in Public Health to further her interests in community and women's health. In her free time, she enjoys being a foodie, dancing, and working on fashion photo shoots for a campus publication.